The AP NFL Defensive Player of the Year Award is given by the Associated Press to the league's most outstanding defensive player at the end of every National Football League (NFL) season. It has been awarded since 1971. The winner is decided by votes from a panel of fifty AP sportswriters who regularly cover the NFL. Since 2011, the award has been presented at the annual NFL Honors ceremony the day before the Super Bowl, along with other AP awards, such as the AP NFL Offensive Player of the Year Award and AP NFL Most Valuable Player Award. Lawrence Taylor and J. J. Watt are the only three-time winners of the award. Joe Greene, Mike Singletary, Bruce Smith, Reggie White, and Ray Lewis have each won it twice. Lawrence Taylor is the only player to win the award as a rookie, doing so in 1981. In 2008, James Harrison became the first undrafted free agent to win the award. Reggie White is the only player to win the award with two different teams, winning in 1987 with the Philadelphia Eagles and again with the Green Bay Packers in 1998. J. J. Watt is the only played to win the award unanimously, receiving 50 out of 50 first place votes in 2014. He was also a near-unanimous winner in 2012 as he earned 49 out of 50 votes. Watt is the incumbent holder of the award after winning it for the 2015 NFL season. As of 2015, linebackers have won the award 16 times, more than any other position. A defensive end has won twelve times, followed by seven defensive tackles, five cornerbacks, and five safeties. Only two winners of the AP Defensive Player of the Year Award have also won the AP NFL Most Valuable Player Award for the same season: defensive tackle Alan Page in 1971 for the Minnesota Vikings and linebacker Lawrence Taylor in 1986 for the New York Giants. 1 2 Rosenthal, Gregg (February 2, 2013). "J.J. Watt near unanimous Defensive Player of the Year". NFL.com. NFL. Retrieved July 11, 2016. ↑ Wesseling, Chris (February 6, 2016). "J.J Watt wins third Defensive Player of Year award". nfl.com. NFL. Retrieved July 11, 2016. 1 2 Wilner, Barry (January 7, 1999). "White named defensive player of year". Herald-Journal. Associated Press. p. D1. Retrieved July 11, 2016. 1 2 3 Brinson, Will (January 31, 2015). "J.J. Watt is first-ever unanimous NFL Defensive Player of the Year". cbssports.com. CBS Sports. Retrieved July 11, 2016. ↑ Corry, Joel (January 2, 2015). "NFL MVP Race Includes J.J. Watt And 4 Other Guys Not Named J.J. Watt". huffingtonpost.com. The Huffington Post. Retrieved July 11, 2016. ↑ "Alan Page 'Hurrys' To Defensive Award". Daytona Beach Morning Journal. Associated Press. January 7, 1972. p. 14. Retrieved July 11, 2016. ↑ Mihoces, Gary (January 5, 1973). "Joe Greene Defensive Player of the Year". The Evening News. Associated Press. p. 6B. Retrieved July 11, 2016. ↑ "Buffalo's Simpson, Dolphins' Anderson Named Top Gridders". Herald-Journal. Associated Press. January 4, 1974. p. B4. Retrieved July 11, 2016. ↑ "Defensive Honor Goes To 'Mean' Joe Greene". Sarasota Herald-Tribune. Associated Press. January 8, 1975. p. 1C. Retrieved July 11, 2016. ↑ "Pittsburgh's Mel Blount Is Top Player". Gettysburg Times. Associated Press. January 9, 1976. p. 11. Retrieved July 11, 2016. ↑ "Lambert defense winner". The Tuscaloosa News. Associated Press. December 29, 1976. p. 15. Retrieved July 11, 2016. ↑ "Martin Named As Top Defensive Player". The Times-News. Associated Press. January 5, 1978. p. 16. Retrieved July 11, 2016. ↑ "Broncos' Gradishar Wins Award". Lakeland Ledger. Associated Press. January 12, 1979. p. 1D. Retrieved July 11, 2016. ↑ "Lee Roy Selmon of Tampa defensive player of year". The Day. Associated Press. December 21, 1979. p. 34. Retrieved July 11, 2016. ↑ Lowitt, Bruce (January 8, 1981). "Lester Hayes picks off defensive player award". Beaver County Times. Associated Press. p. B-1. Retrieved July 11, 2016. ↑ "Taylor 1st rookie to be Defensive Player of Year". The Evening Independent. Associated Press. January 8, 1982. p. 4-C. Retrieved July 11, 2016. ↑ "Defensive player honors go to Taylor once more". The Spokesman-Review. Associated Press. January 8, 1983. p. 15. Retrieved July 11, 2016. ↑ "Miami's Betters Named Defensive Player Of Year". Sarasota Herald-Tribune. Associated Press. December 23, 1983. p. 14B. Retrieved July 11, 2016. ↑ "Seahawks' Easley top defender". The Sumter Daily Item. Associated Press. December 19, 1984. p. 2C. Retrieved July 11, 2016. ↑ "Chicago's Singletary gets defensive honor". The Free Lance-Star. Associated Press. December 31, 1985. p. 9. Retrieved July 11, 2016. ↑ "Taylor sweeps post-season honors". The Free Lance-Star. Associated Press. December 31, 1986. p. 14. Retrieved July 11, 2016. ↑ "White named top defensive player". The Hour. Associated Press. December 31, 1987. p. 25. Retrieved July 11, 2016. ↑ "Top defensive player: Singletary". Gettysburg Times. Associated Press. December 29, 1988. p. 2B. Retrieved July 11, 2016. ↑ "Millard defensive player of year". The Times-News. Associated Press. December 30, 1989. p. 15. Retrieved July 11, 2016. ↑ "Buffalo's Bruce Smith honored". Ellensburg Daily Record. Associated Press. January 10, 1991. p. 11. Retrieved July 11, 2016. ↑ "Saints' Swilling Defensive Player of the Year". Kingman Daily Miner. Associated Press. December 30, 1991. p. 6. Retrieved July 11, 2016. ↑ "Seattle tackle named defensive player of year". The Times-News. Associated Press. January 6, 1993. p. 1B. Retrieved July 11, 2016. ↑ "Steelers' Woodson top defensive player". The Southeast Missourian. Associated Press. January 7, 1994. p. 2B. Retrieved July 11, 2016. ↑ "Sanders are players of the year". The Tuscaloosa News. Associated Press. December 29, 1994. p. 3C. Retrieved July 11, 2016. ↑ "Bills' Paup garners defensive player of year award". The Victoria Advocate. Associated Press. December 29, 1995. p. 3B. Retrieved July 11, 2016. ↑ "Consolation for Smith: Bills star voted Defensive Player of Year". Sun Journal. Associated Press. December 30, 1996. p. 1C. Retrieved July 11, 2016. ↑ "Stubblefield is defensive player of year". Lodi News-Sentinel. Associated Press. December 26, 1997. p. 17. Retrieved July 11, 2016. ↑ "Bucs' Sapp named NFL's top defensive player". The Southeast Missourian. Associated Press. January 14, 2000. p. 1B. Retrieved July 11, 2016. ↑ Ginsburg, David (January 3, 2001). "Ravens' Lewis named defensive player of the year". Moscow-Pullman Daily News. Associated Press. p. 1B. Retrieved July 11, 2016. ↑ Wilner, Barry (January 17, 2002). "Sackmaster Strahan wins Defensive Player award". Kingman Daily Miner. Associated Press. p. 7. Retrieved July 11, 2016. ↑ Wilner, Barry (January 9, 2003). "Bucs' linebacker is NFL Defensive Player of the Year". The Argus-Press. Associated Press. p. 15. Retrieved July 11, 2016. ↑ "Ravens Lewis' win player of the year awards". Boca Raton News. Associated Press. January 1, 2004. p. 24. Retrieved July 11, 2016. ↑ "First safety in 20 years to win defensive award". Associated Press. January 7, 2005. Retrieved January 5, 2009. 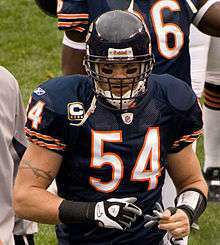 ↑ "Urlacher named AP Defensive Player of the Year". espn.com. Associated Press. January 6, 2006. Retrieved January 5, 2009. ↑ Wilner, Barry (January 5, 2007). "Taylor takes home AP Defensive Player of the Year honor". USA Today. Associated Press. Retrieved January 5, 2009. ↑ "AP picks Colts' Sanders as top defensive player". espn.com. Associated Press. January 7, 2008. Retrieved January 5, 2009. ↑ "Harrison has death grip on defensive award". espn.com. Associated Press. January 5, 2009. Retrieved July 11, 2016. ↑ "CB Woodson voted AP's top defensive player". nfl.com. Associated Press. January 12, 2010. Archived from the original on March 26, 2010. Retrieved October 27, 2010. ↑ "Steelers' Polamalu voted AP's NFL Defensive Player of the Year". nfl.com. NFL. January 31, 2011. Retrieved July 11, 2016. ↑ Zrebiec, Jeff (February 4, 2012). "Terrell Suggs selected AP Defensive Player of the Year". Baltimore Sun. Retrieved July 11, 2016. ↑ Brinson, Will (February 1, 2014). "Luke Kuechly wins 2013 Defensive Player of the Year". cbssports.com. CBS Sports. Retrieved July 11, 2016. ↑ "J.J. Watt wins third Defensive Player of the Year award, calls out doubters". cbssports.com. CBS Sports. February 7, 2016. Retrieved July 11, 2016.